Jailhouse Strong brings you this bodyweight-only workout for upper-body strength and explosive power. With a few small changes to some common bodyweight moves, this workout will burn you down as it builds you up. Back in 1910, Ghulam Mohammad Baksh, better known by his ring name of "The Great Gama," won the world heavyweight wrestling championship. He remained undefeated in a career that spanned more than 50 years. At 260 pounds with a 56-inch chest, Baksh was considered one of world's strongest men—and his strength came exclusively from bodyweight training. Herschel Walker won the 1982 Heisman Trophy as a running back and played in the NFL for 12 seasons. More recently, he won an MMA fight at over 50 years of age, displaying a divinely-carved physique that outshone fighters half his age. Walker trained without equipment, too. Generally, bodyweight training is viewed as a way to enhance conditioning or get a pump, both of which it masterfully does. Properly applied, though, equipment-free training can build you that all-around, fully functional, farm-boy, "bear-wrasslin'" strength. This upper-body bodyweight workout is designed to help you build strength. All you need is your own body and your willingness to work. McGill pull-ups look like a regular pull-up, but with one important difference: You perform each one as a single repetition, expending 100-percent effort—maximum force and explosion. The focus here is on quality, not quantity. If these pull-ups seem easy, explode harder. Doing them at this intensity will allow you to maximize your neuromuscular drive, increase your rate of force development, and build better technique. For decades, elite strength coaches have referred to the dip as the upper-body squat because, like its counterpart, it is such an effective way to pack on strength and size. In his book "Target Bodybuilding," Per Tesch discussed how MRI studies show that dips significantly work all three heads of the triceps, making them a favorite among Jailhouse denizens! Focus on a controlled negative and a forceful positive. Take a 2-minute break between sets. Grasp a chin-up bar with a supinated (palms facing you) grip. From a dead-hang position, pull your chin over the bar and hold the position for 2 seconds. Next, descend to the halfway point and hold that position for 2 seconds. Repeat this combination for the rest of the sets and reps. The Hercules chin-up is a creation of the Jailhouse Strong system. It provides hellacious overload on the back and biceps because it combines both a full range and a partial movement—and requires precision starting and stopping power. This is a great way to build functional strength for pulling movements as it jacks your physique. This exercise will blast the back arms (or triceps, as you lab rats call them). The beauty is not only in how effectively this movement isolates the triceps, but how much control you have over how intensely you perform it. The lower the horizontal bar or the farther back you place your legs, the harder the movement will be. A true bodyweight "OG" can even elevate her legs to elevate the intensity. A well-developed neck separates function from fluff, and you don't need fancy equipment or even a gym membership to build one. All you need is head nods, a fundamental training technique that evolved out of some of Brazil's toughest favelas (ghettos). Lie on your back, lift your head, and bring your chin to your chest for a set of 10 repetitions. With your head still lifted, look to your left for a set of 10. Now, look to your right for 10 more reps. Finally, and with your head still off the ground, touch your left ear to your left shoulder for 10 repetitions. Repeat to your right. If you've never done any neck training, yours will be screaming as you do these small movements. The good news is that you can do head nods while lying in bed! Every athlete in every sport will benefit from strong shoulders! If you never look beyond barbells, dumbbells, and machines, you're leaving gains on the table. 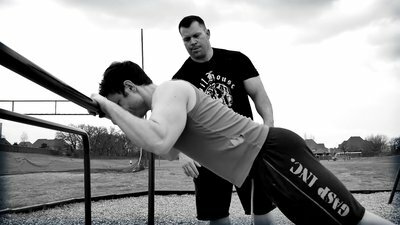 These bodyweight push-ups are one of the best ways to develop shoulder strength. Handstand push-ups require you to push-up nearly 100 percent of your body weight, which is a far greater demand than a regular push-up. Beyond strength, these push-ups require balance and core strength—strengths that will carry over onto any field of play. This is an advanced movement. If you're new to it, start with pike push-ups and progress to a full handstand push-up. Many people believe this is the exercise primarily responsible for building Great Gama's massive 56-inch chest. Legend has it he performed as many as 3,000 a day! This exercise was also a favorite of Karl Gotch, the "God of Wrestling," who taught it to Matt Furey, who taught it to the masses in his book "Combat Conditioning." Hindu push-ups are not just a pec-pumping finisher! Properly performed, they'll build your shoulders, chest, core, spine, and arms. As you glide from the downward dog position to the upward dog position, you'll stretch your chest, back, and hips to improve your flexibility and mobility.